What do the French student movement, the strike in the SNCF, and the various movements in the public services really have in common? Fête à Macron, Paris, 5 May 2018. Photo: Olivier Ortelpa. via Wikimedia Commons. Across several long weeks, a variety of movements including occupations and blockades have been causing a stir in the universities. At the same time, resilient strike actions have paralysed part of the transport sector. All this takes over the reins from previous mobilisations in France, with the square occupations in opposition to the "Loi Travail" in recent years. But seen in historical terms, these movements are also part of the situation that began with the "Arab Spring," with masses of people taking over public sites across extended periods. We have to recognise that for the moment at least, none of these movements has brought positive change, even in the subjective situation, which is more or less everywhere marked by a considerable rise in identitarian fascisms, be they nationalist, religious, or both at once. The strongest movement of all, in Egypt, led to nothing but the military officers returning to power in an even more aggressive form. The square occupations in Turkey consolidated Erdogan’s stranglehold over the country. But in France too, we can see that after Nuit Debout and the Loi Travail, we have been bequeathed Macron’s government, in the pay of interests other than the people’s own. When we mount a general analysis of all these "mobilisations," we very quickly see their lack of positive slogans and the fragility of their apparent unity. "Mubarak, resign!" can rally a crowd, but these crowds are far from in agreement what political force ought to replace Mubarak. On 5 May there were protests in France making an ironic "toast to Macron"; but this tells us nothing about what a different kind of government would mean, in the conditions of the present moment. We often speak of a "convergence of struggles." But what exactly would they converge around? 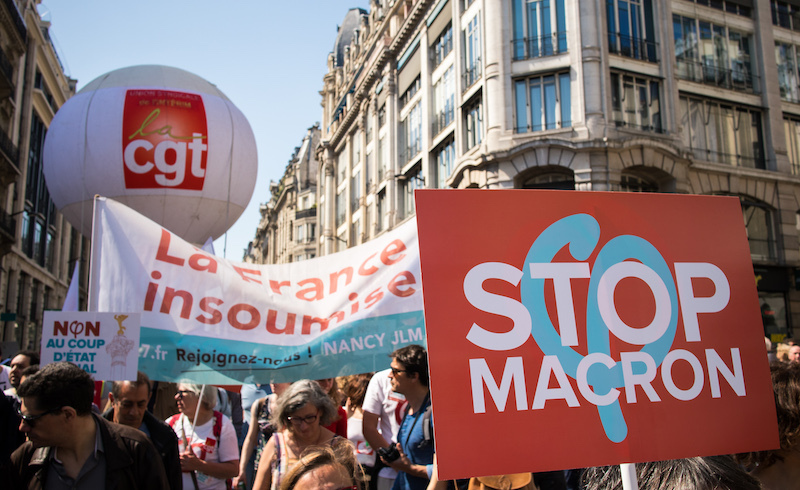 The movements’ shared hostility to the reforms rammed through by Macron’s government certainly points to a common enemy. But this hardly amounts to a shared positive conviction. And since even posing this problem would immediately divide the movement, it is considered dangerous to do so. But I think that this is mistaken. The effect is that the only idea advanced as something which the various struggles could converge around is… the purely tactical, and in reality empty, call for a "convergence of struggles." Such a tautology is bound to be ineffective. Here, I would like to help us find a more real point of unity, a rallying call appropriate for the present situation. Without doubt, this would introduce a political dividing line within today’s scattered movements. But it would also produce more active and resilient fighting units. A unifying slogan has to propose some positive content that the forces it seeks to unite do indeed have in common. But what do the student movement, the strike in the SNCF [nationalised rail network], and the various movements in the public services — from hospitals to the post office — really have in common? The point they have in common is that all of them are hit by current or future projects for the generalised privatisation of all that remains of the public realm. Certainly, privatisation is nothing new, either at the level of planning or implementation: since 1983 both Left and Right have actively participated in this process. But today, generalising this privatisation is the very heart of Macron’s action in government. The students can see that the establishment of a selective admissions system opens the way to an anti-egalitarian system of private universities; the railworkers can see that "opening up competition" is a smokescreen for plans to carve up the SNCF for the benefit of private profit; the public hospital employees can see that after the privatisation of auxiliary services and the establishment of private clinics within public hospitals, the next step will be the privatisation of the hospital as a whole. The postworkers can see that, given the private power of the companies that control the Internet, and the fact that telecoms have already been privatised, the ordinary post office will be sold off and made a counter in a supermarket or grocery store, as in several other countries. And so on and so forth. The unifying slogan we need is: "No to privatisation, of any kind." Not only the privatisation Macron wants, but also that which has been constantly pursued since the 1980s, which lay the ground for the dismantling of anything that looks like a public service. One could say that this slogan is also negative. But that is only apparently the case: for it immediately leads us to the question of what will come in place of the privatised services, and what general doctrine should govern this change. In this regard, the word "nationalisation" is too limiting, and inappropriate. This question has nothing to do with the "nation." What counts is the collective dimension of this appropriation, as against these services continuing to be privately appropriated. The positive formulation of this slogan could be: For a collective, public-spirited appropriation of everything that concerns the public good. The priority focuses are education, healthcare, transport (which does not mean the family car), ports, airports, motorways, roads, energy, and drinking water. In passing, it is worth remembering Marx’s very precise definition of the "communist," the militant who serves the public good. He attributed the communist three particular capacities, when she takes part in a movement against "the existing social and political order." The communist ensures that no narrow nationalist or chauvinist interest predominates over the universal aim of communist activity (internationalism); her concern is the movement as a whole and the stages to come, not just immediate tactical goals (strategic vision); and she attaches each movement to the fundamental question of property. Marx adds that the communists "bring to the front, as the leading question in each [movement], the property question, no matter what its degree of development at the time" (real communism). Today, the "degree of development" in question is determined by the continual wave of privatisations. It is with this criterion in mind that we must act and make proposals in all the movements today. My proposal is the following: we know of the historical existence of a "minister of the economy, finance and privatisation." We also know that there is a "privatisation board," defined as the technical organ that aids the government "in the development, implementation and monitoring of its policy for public companies." It is striking, indeed, that the "thinkers" behind the policy for public companies have come together in a "privatisation board"! • The general disappearance of the word "privatisation" from anything that concerns "policy for public companies." An immediate stop to all privatisation projects and the dissolution of the bodies concerned. • The re-examination of all the "privatisations" carried out since the mid-1980s. • The creation of a monitoring commission on this question, especially working on the various possible forms of collective appropriation. If you approve of this text, or at least its main points, I would ask you to distribute it or some variation of it consistent with your own judgment. You could do so anywhere or in any movement that you think will be interested by the slogan "down with privatisations." In any case, I thank you for your attention.